Warrior has made great strides (get it?) in past years, especially when their gloves and sticks are in discussion. 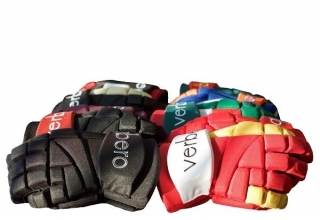 Their latest released product, the Warrior Alpha QX glove was what they advertised to be – a modernized 4-roll glove. The concept, after further elaboration, was described as a “tailored traditional fit”. For me personally, this grabbed my attention and wildly piqued my interest. 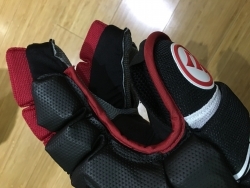 The “boxy, traditional” fit of 4-roll gloves has been a staple of the hockey world for years; one could only question whether their modernized fit would make a lasting impression on the product world, or be a dying fad. 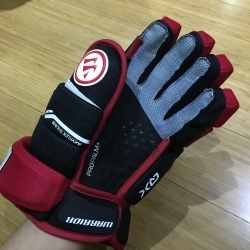 After two weeks and extensive use (of both playing and coaching) with the QX Gloves, I’m ready to discuss and review my experience with Warrior’s latest and greatest. To set a timeframe on the review, I’ve logged over 40 hours with the gloves since start of use. 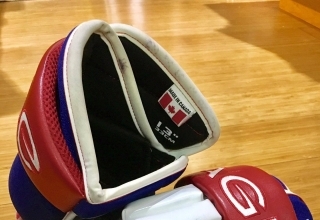 The time is a mix of playing and coaching – including several hours of shooting lessons, which really allowed me to abuse and test the gloves. The initial impression I had when trying the gloves on, and the impression that most players will receive, is that it’s a tight fitting glove. It’s a drastic change from your typical 4-roll glove and for those seeking the loos e fit, it may not be to your liking. The next factor that stuck out was the overall shape of the glove. 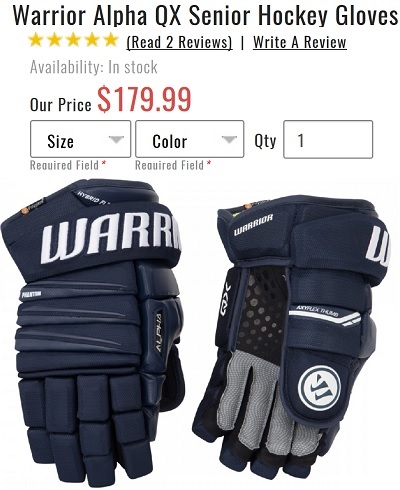 As advertised, Warrior really pushed to create a glove that has a “hybrid taper fit” (see picture). The most important aspect of the picture is a view of the glove’s main channel. 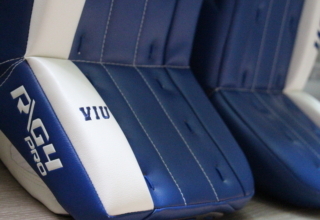 The rounded, U-shape created by the foam and shell of the glove is what gives the Alpha line its unique fit. The other glove (also featured) is an Easton 4-Roll glove. The main difference, is the lack of shape and support the inner foam and shell provide. Now that an idea of fit has been established, I’m happy to clarify that the gloves are incredibly comfortable. I find the fit to be a huge improvement from their Dynasty line, and that Warrior has done a much better job of establishing a “butter-soft feel” than in previous years. The aspects of comfort will be discussed piece-by-piece as we go along. Warrior describes palm specs as a “black Clarino with a gray digital base” and “black clarino overlay with an embossed grip pattern”. Clarino is a synthetic leather that’s meant to simulate suede. 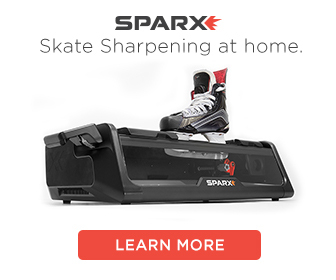 It’s hugely popular in the NHL, and often used because of the soft and supple feel. 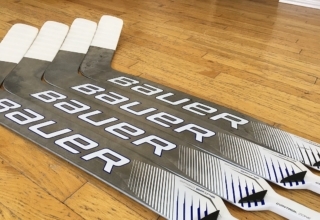 Other gloves that feature a Clarino palm include the CCM Ultra Tacks, Bauer Nexus 800, and Warrior’s own AX1 and QR1 – it’s a popular choice on the retail level too. “Digital” is another form of synthetic palm, used for its performance features and exceptional feel. 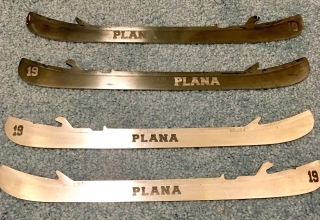 It’s thinner than most other materials and has a pattern stamped on to increase grip. I’m a big fan of this combo. I think the palm offering is a great choice to provide a soft and comfortable palm; the Clarino overlay also prevents durability from being a short-term issue. With that in mind, I’m very uncertain about the grip pattern (the shiny hexagons in the black palm). Through shooting and stickhandling, I haven’t felt any benefit from the embossed grip; in my mind, the hexagons are purely aesthetic. Although they might appeal to a younger audience, they do nothing for me. The gussets were a bittersweet feature of the glove. The picture attempts to show the tapered finger channels. That’s a huge benefit in my eyes. By tapering the fingers, it gives a tighter and more precise feel when holding a stick. There’s less movement where it matters – at the fingertips. That said, the gusset material is spandex. I understand that grip and finger mobility were huge determinants of the materials, but I would have been a lot happier had the gussets been mesh (much like their QRL glove and previous AX1). But overall, it’s not something to cry over, simply something I’d like to see in the future. Mobility gets broken up into two aspects: mobility of the fingers and mobility of the wrist. The mobility of the fingers passes with flying colours. One issue I’d noticed in the QR1 and Dynasty line, is that dexterity in the fingers wasn’t up to par. Customers and coworkers alike would notice the fingers not closing as seamlessly as they should. Warrior has done a fantastic job of fixing the issue in both the Alpha and the QRL line -I’m able to easily grip and let go of a stick without any issues. Also new this year are angled back rolls. They allow the fingers bend better and move with your knuckles. It’s a subtle feature that makes a huge difference; really nailing down “a glove that moves with you”. Wrist mobility is more than adequate for me. One hindrance of the glove is that because it maintains the hybrid fit, the cuff isn’t as open or free as I’d like it to be. However, the glove also includes the “hybrid flex cuff”. It’s a spandex that connects the cuff to glove, letting the cuff move more freely with your wrist. Overall, the mobility is great. The cuff isn’t as open as traditional 4-roll gloves, or even compared to Bauer’s Vapor line, but it does the job. Warrior has always done a solid job of protection. A huge driving point in their gloves for me is their “phantom foam”. They’ve gone ahead and upgraded their foam package and added what they call “BoneSystem premium plastics” to the fingers, backhand and thumb rolls. In essence, it’s mixing multiple density foams. It allows for weight to stay low, but doesn’t sacrifice protection. I put the glove through the toils of playoff hockey and I have yet to feel the burden of any slashes or hacks. I have yet to block a shot, but I imagine the foam would take the brunt of the impact. 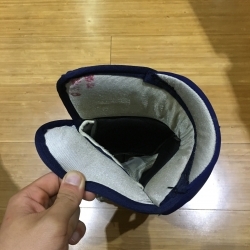 One criticism, is for the added back roll bumpers which are meant to add protection to the backhand. I think aesthetically they look fantastic: they’re clean, sharp and add color. I have a difficult time wondering if there’s actually any practical use for them, and if they really give extra protection. Durability for me is short and sweet. 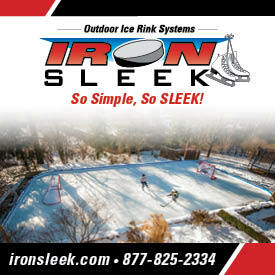 Through forty hours of use – including four to six hours of shooting pucks – the palms have nothing but mild pilling. The Clarino overlay will do a great job of keeping the palms intact. The shell of the glove is composed of tuftek (nylon), “dynamesh” and PU (polyurethane). The colour of the bumpers have peeled partially from impact and use, though that doesn’t take away from the durability outside of a visual standpoint. The mix of materials is a good compromise. Tuftek is lightweight and doesn’t absorb water. Dynamesh is lighter but used scarcely to maintain durability. PU is used in the index finger to withhold hacks and slashes. I think that Warrior’s done a great job of making a light glove, that’s still durable. Didn’t make popcorn? Here’s the skinny! The glove is seriously lightweight. 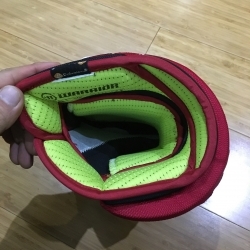 Although it’s not the lightest offering on the market, given how well the glove moves with you, it’s light enough that you wouldn’t notice a difference compared to other gloves. Finger feel and dexterity: Tapered gussets and the mobility in the fingers make for a very happy camper. Warrior killed it in this aspect. A digital palm with a Clarino Overlay. The softness of the palm combined with the mobility makes for a game-ready glove. As cheesy as it is, Warrior wins. They’ve really made a “butter-soft” glove. If you prefer a traditional palm, try the QX Pro – it’s a full Clarino palm and 20 grams lighter. Unnecessary aesthetics: Perhaps others who have used the glove can correct me, but I think the diamond pattern on the palm contributes nothing to the grip. Sadly, I feel the same way about the backhand bumpers – both a cool aesthetic, but lacking practical use. Spandex Gussets: Don’t get me wrong, this really isn’t the end of the world. 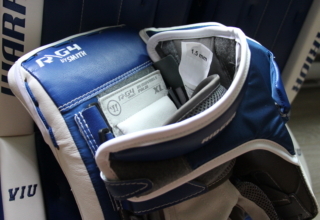 That in mind, it was a huge bonus of the QRL and AX1 glove. For breathability and mobility purposes, I really would have loved to see a mesh gusset. 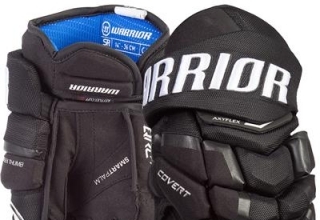 Warrior’s new Hybrid fit: As much as I like the fit, I’m sure there are traditionalists who would prefer a looser, volume-based glove. The fit might not be for everyone. If you’re not a fan, but still like the Alpha line, I recommend cutting the backhand foam out – but warning again: doing so will void the warranty. If you’re looking to pick up the gloves, or just shop around and compare prices, we recommend HockeyMonkey. First because they are the market leader with competitive prices and a great selection, and 2nd because they are a sponsor of our site!